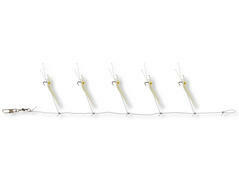 Herring rig with 5 hooks and glow bead. With real fish skin. 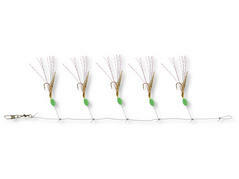 Rig with 5 hooks, glow bead and real fish skin. Perfect for catching sandeels. SEACOR Herring Rig "Fine Glow"
With 5 hooks, glow head and real Japanese fish skin. Perfect at cold water when herrings are less active. 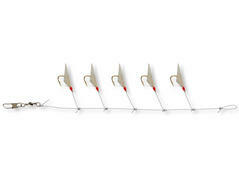 Herring rig with red bead, 5 hooks and real fish skin. SEACOR Herring Rig "Brown Skin"
Rig with 5 hooks, glow bead and real Japanese fish skin. SEACOR Baby Shrimp Herring Rig "Glow"
Shrimp herring rig with 5 hooks. 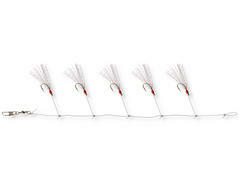 Herring rig glow-pearl with 5 hooks and red bead.